Drywall sheet sizes. Gypsum boards dimensions. What are the standard dimensions of a drywall sheet? Dimensions of gypsum boards are determined by construction standards. Distance between wall studs and ceiling joists 12”, 16” or 24 inches in the U.S. depending on particular structure, load limitations and local codes. Width and often length of drywall sheets made according to these measurements. 4 x 8 feet plasterboard will cover 5, 4 and 3 wall studs with 12, 16, or 24 inches distance between studs respectively if hang the sheet vertically and 9, 7 and 5 studs if hand horizontally. There are other dimensions of gypsum boards available, but typically width, length or both parameters will stay within the whole numbers to a certain amount of studs and joists. 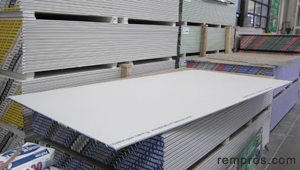 Gypsum boards available in five different thicknesses 1/4”, 3/8”, 1/2", 5/8”, 3/4", two width 48 and 54 inches, but 48” much more common option, and vary in length from 8 to 16 feet. A – area covered by one sheet of drywall. All parameters in the chart are imperial measurements – sheets width, length and thickness in inches and cover area in square feet. Depending on dimensions, calculate how many square feet is one sheet of drywall. Measure room walls and ceiling and convert it to ft². Divide the total room square footage excluding openings for windows and doors by the area of one gypsum board. For typical 12’ x 12’ room with 8’ wall height, one 2’6” W x 6’8” door and two 3’ x 4’ windows 18 sheets of drywall will be necessary to cover walls and ceiling. While estimating the number of gypsum boards all the time add about 7 – 10% for waste. Deduction for doors and windows vary dependable parameter. In standard room you do not deduct space for regular doors and windows openings. But in some cases wide sliding or patio doors with up to ceiling windows will take about 20% - 25% of a total wall area what should be taken into consideration while estimating the number of drywall sheets require. In Europe dimensions of plasterboards measured in metric units and manufacturers and building materials retailers provide width, length and thickness in millimeters (mm). There are typically four thicknesses: 9.5 mm; 10 mm; 12.5 mm and 15 mm. There are also bigger boards available such as 1350 x 4800 or 1350 x 6000, but they are less popular. One sheet 4’ x 8’ x 1/2” of drywall weigh about 52 – 58 pounds (24 – 26 kilograms) with proportional decrease or increase in weight depending on its width, length and thickness. Some manufacturers offer light or ultra light drywall panels for convenience during installation and transportation. The weight might be reduced as much as 25 – 40% in comparison with standard sheets. Moisture and mold resistant drywall or green boards typically 48” wide, 96” (120”) long and 5/8” (1/2”) thick.